When blowing things up, more is generally merrier. Second Encounter offers way, way more. Just dont go it alone. Sam Stone is like a shark with guns – if he stops moving and fighting for even a moment, he drowns in a sea of furious enemies. 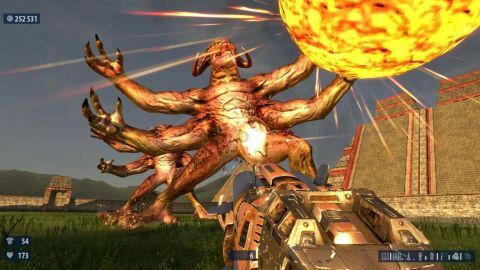 Played in co-op with a buddy, Serious Sam HD: The Second Encounter is a simple, intense run and- gun shooter with hundreds of enemies of all shapes and sizes streaming towards you as if drawn in by powerful magnets in your pants. It's an absurd game full of absurd baddies – such as Jack-O-Lanternheaded chainsaw murderers and sunburned space aliens – that have nothing to do with the settings (Mayan ruins, Ancient Egypt, jungles) or even each other (good thing there's no story). It makes no apologies for its lack of sophisticated AI or its blocky, undetailed level design straight out of Quake. Death is meaningless – you just respawn and resume firing. Short, controlled bursts are for wimps. Compared to The First Encounter, not much has changed. Sam has a handful of extra weapons, including a chainsaw that cartoonishly bisects enemies as they charge and impale themselves upon it, a supremely powerful sniper rifle and a room clearing bomb, but for the most part The Second Encounter is little more than a bunch of new maps on which to kill the same enemies with the same weapons. Not that there's anything wrong with that, of course, but I do wish that Croteam's level designers would recognise that jumping puzzles aren't their strong point. Battling gravity and momentum is much less fun than battling giant fireball-chucking demons. However, most of the joy of co-op disappears when played solo. On your own you're confronted by an onslaught of enemies that isn't adjusted to suit half the firepower, leaving you massively outgunned on normal difficulty. Instead of instantly respawning, you load to whenever you last remembered to hit F6 to quicksave (there's no autosave). If you do play single-player, be sure to tone down the difficulty to Easy or Tourist unless you like to replay difficult areas a dozen times until you get lucky.